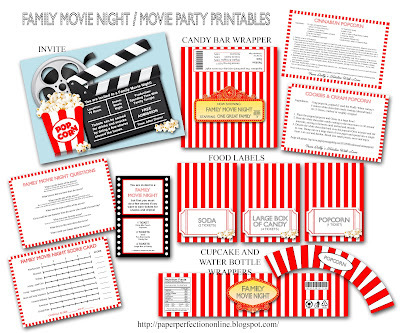 I made these printables awhile back for a movie birthday party and then rediscovered them before Christmas and used them to make fun "Family Movie Night" baskets with candy, movies, drinks, popcorn, etc. that I gave to several families for Christmas gifts and auctioned off at a school fundraiser. I included a roll of tickets in each basket that I purchased at Wal-Mart to encourage chores around the house as it’s hard to escape into a movie when you’ve got dishes and laundry calling you from the other room. You can work together as a family to get household chores done before the movie starts which is good motivation! Even young kids can help pick up toys, dust and put away laundry. You can motivate your kids to help with chores by “selling snacks and drinks” they don’t normally get to eat during your family movie night. 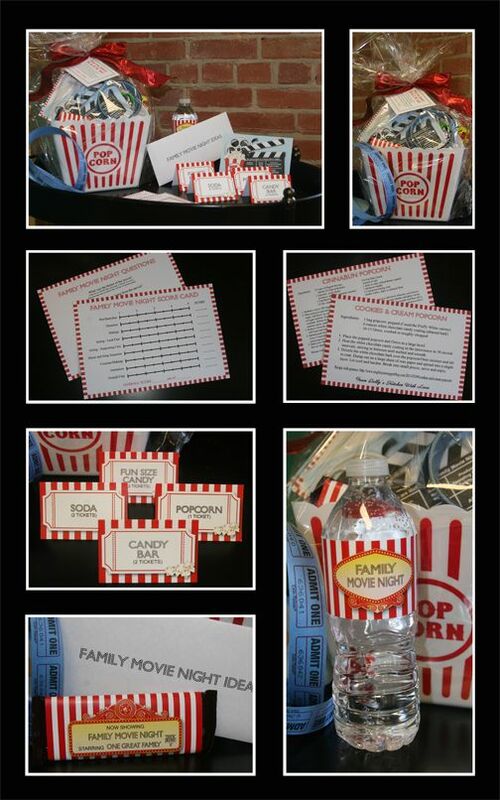 Have each child earn “tickets” for each chore they accomplish towards snacks and drinks at your concession stand. A good way to get the kids excited is set up the concession stand the night before movie night (after the kids have gone to bed). Then when they wake up they can see what fun items they can purchase at the store if they accomplish a few chores around the house or yard that day. Anyways, I have lots of fun printables for a movie birthday party or family movie night including an invite, family movie night idea sheet, cupcake wrappers (for "popcorn" cupcakes), a movie score card, a movie question sheet, food labels, water bottle and candy bar wrappers, fun popcorn recipes, bag toppers and more! If you are interested in having a movie party, hosting a family movie night or giving family movie nights as a gift or fundraiser contact jtanddolly@yahoo.com for details and pricing.